Although founder Ferruccio Lamborghini first went into business building tractors in the early 1950's, the Lamborghini we now know has its focus on a much faster type of vehicle. Famous for its muscular, aggressive, low-slung sports coupes, it is perhaps only fitting that Lamborghini chose a raging bull for its emblem, and that all car models are named in reference to bullfighting. However, while bullfighting has largely gone the way of the buffalo with the advent of animal rights activism and more modern forms of entertainment, the Italian automaker remains a threat to the status quo in the automotive industry. Now owned by Volkswagen, Lamborghini continues to produce some of the world's fastest, most exciting cars from its factory in Northern Italy. With a total of 910 horsepower from its combintaion of 3 electric motors and one gasoline V10, this wild hybrid supercar would join the ranks of the Porsche 918 and Ferrari LaFerrari among the most exlusive eco-conscious cars on the planet. The word Superveloce means "superfast" in Italian, and it's a fitting description of Lamborghini's latest edition of the Aventador. It's lighter, more aggressively styled, and makes 740 horsepower, which helps it to hit 60 mph in 2.8 seconds, superfast indeed. Following in the footsteps of the iconic Lamborghini Gallardo, the all-new Huracán offers inspired design and innovative technology in an easy-to-drive package. 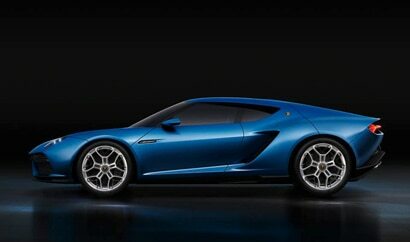 A direct-injected, 610-horsepower V10 shoots the lightweight coupe from 0 to 60 in 3.2 seconds. This convertible version of the Lamborghini Aventador features the same bold looks and adrenaline-pumping performance as its fixed-roof sibling, jetting from 0 to 60 in just 3 seconds flat. Drop the top to enjoy the throaty roar of the 700-horsepower V12. Featuring sharp, aggressive styling, precise handling and a 6.5-liter V12 that generates an astounding 700 horsepower and 509 lb-ft of torque, the Lamborghini Aventador is one bull who's not afraid to show its horns. 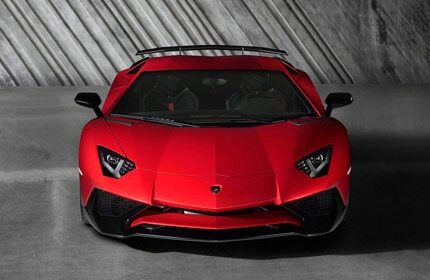 This super fast sports sedan, tentatively scheduled for a 2012 release date, is set to be the first production Lambo with 4 doors. Fitted with a ferocious, Gallardo-based 560-horsepower V10, the Lamborghini Estoque may be the first daily driver to approach the 200 mph mark. Escape anonymity with the sharper, lighter and more powerful all-wheel drive Gallardo, an ultra-fast coupe boasting a 5.2-liter V10 engine capable of cranking out 560 horsepower.